Myth 1. Pregnant women crave pickles and ice cream. Not all women crave pickles and ice cream. In general, food cravings can help in telling you what your body needs. Women who crave pickles are really craving salt and may be mineral deficient, and specifically sodium deficient. 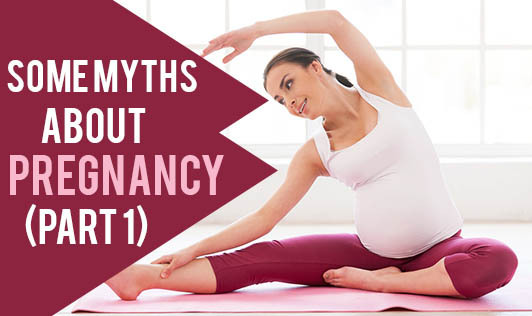 Additional minerals are particularly important in pregnancy when women's bodies increase blood volume by up to 20 percent, so the existing minerals are diluted. Many pregnant women crave junk food as it is associated with comfort. Sugar found in sweet foods, breads, pasta and rice cause the body to produce serotonin, which makes women feel good. Myth 2. Pregnant women who carry low = boy, or pregnancy acne = girl. Women tend to carry lower or higher depending on their body type. Taller, thinner women appear to carry higher. Shorter and fuller women appear to carry lower. Neither has any correlation to gender. Also, in a second pregnancy, since abdominal muscles may be looser, the pregnancy may appear to be lower. Pregnancy acne has nothing to do with gender; it is a result of natural hormonal changes. Myth 3. Pregnant women must eat for two; they must gain 25 pounds. As long as a pregnant woman eats healthy and properly - and as long as her doctor is not concerned - there is no set formula for how much she must gain. Generally, in the last trimester, the baby gains half a pound a week. So, as a general rule, if, during this time, the pregnant woman is not gaining a bit more than that, her doctor may be concerned and her diet should be re-evaluated. Myth 4. Pregnant women shouldn't take baths. • Help the mother relax and alleviate anxiety about the health of her baby. This is also why swimming is such a great pregnancy exercise. Myth 5. Pregnant women shouldn't dye their hair. This isn't completely false. Pregnant women should avoid anything chemicalized - from food to hair dye. Just like with the foods they eat, pregnant women should try to expose their bodies to as few artificial products as possible. Hair dyes are no exception. But, of course, that means one can use natural hennas instead to colour their hair. Myth 6. All pregnant women have morning sickness. The feeling of morning sickness is often caused by a rise in the female hormone estrogen during pregnancy. If the pregnant woman's body already produced a high level of estrogen prior to her pregnancy, additional estrogen may cause morning sickness in the first trimester - or not. It really depends on the individual.